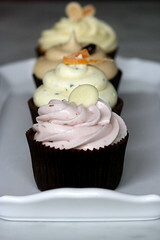 I wanted to share some photos of cupcakes made by a friend of mine, the owner of Whiskie Bits. She and I met through the blog a while back and we have since become good friends. I have had the opportunity to taste about ten different flavors of her cupcakes over the past few weeks and all I can say is that every one of them has been fabulous. I rarely eat cupcakes out because I bake them so often. But I have tried many of the local purveyors and have yet to be impressed. To be honest, I prefer my own. 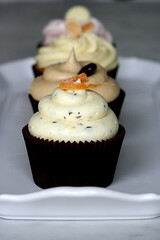 But these cupcakes, well, these cupcakes are like ten times better than mine (ok, maybe I exaggerate). So good, that I had to post about them. I want to warn you… Whiskie Bits is currently a one woman show and the owner is very busy. But if you are in the bay area, you should at least try to get her to cater your next event. You won’t be disappointed. Her cupcakes are truly phenomenal. Here are some pictures I took of a few different flavors. By the way, I will be posting my next recipe here very soon. Those all sounds and look absolutely divine. I went to her website and there are even more amazing flavors there! I wish she could ship! You do realize that I am now trying to think up a reason to have a party so I can try her treats! Well, she disagrees with me… She just emailed me saying mine are great. I think what she has on my is a developed palate (she is a pro after all and not an amateur like me). She gets a great intensity of flavor that I shy away from. The quality of the end result is on par though for sure. But really, I would expect hers to be better given she bakes them ten-times more often that I do. I agree with Cheryl. The more you practice at baking; you will develop better techniques and skills. And even refine your taste buds. But again, that is all subjective….. Sorry I want to say cupcakes, have problem with my english sometimes, but you understand me. 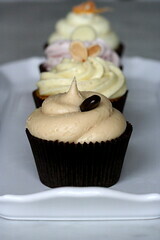 Is there any way to get my hands on the chocolate espresso and salted caramel cupcake recipe? I absolutely love salted caramel ice cream and this cupcake sounds so good! What beautiful cupcakes! 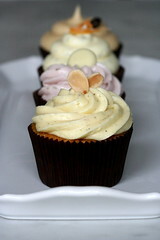 I *heart* the saffron cardamom cupcakes. Question for Cheryl and Trilly. I am not an american buttercream frosting fan , but I want to make cupcakes that have frosting that is not too sweet. I noticed that you both use cream cheese a lot in your cupcake frostings, does this give the body and stiffness you would want in a frosting without making it too sweet?